Order in next 4 hours and 30 minutes for despatch today. 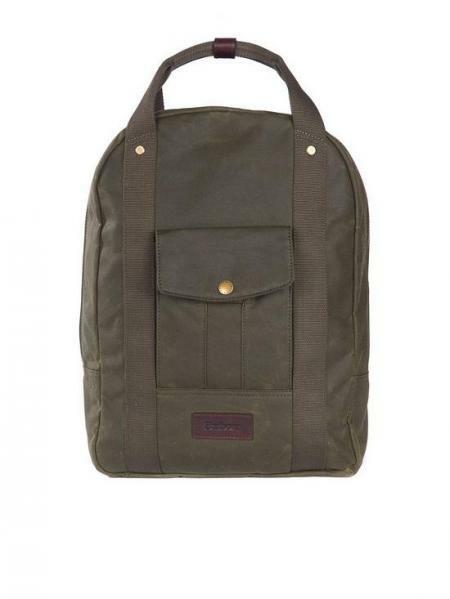 Barbour Houghton Wax Cotton Backpack in Olive. Carry your personal items in style with the Barbour Houghton Backpack. Crafted from a waxed cotton outer, this backpack will keep your essentials dry if you get caught out by a shower, making it perfect for whether you are commuting into the office or heading out to explore the countryside. This versatile backpack boasts a front pocket, as well as a large main pocket with an internal padded laptop sleeve and an additional inside pocket, providing ample space to store everything that you could possibly need whilst you are out and about. Designed with style and practicality in mind, the Houghton has 2 top grab handles, padded adjustable shoulder straps and a padded back panel to offer the upmost comfort whilst you are carrying the backpack. Finished with a leather trim and Barbour signature branding for that added mark of quality and style, we think that this backpack is the ideal accessory to complete your Barbour ensemble with ease.